I've been put off reading Jane Austen's books for a long time, because I tried reading Pride and Prejudice when I was probably too young. But, as I've grown older, I've heard nothing but praise for her work, and so my university self couldn't help but pick up Persuasion. Why this one in particular? I had heard very good things about it, and I found myself warming to the idea of a shy and ignored heroine. Persuasion follows Anne Elliott, the daughter of a baronet whose vanity and desire for high living far outweigh his finances. As a result, he finds it necessary to move his family to cheaper accommodation in Bath and rent out their ancestral home to bolster their finances. Anne is not consulted in this or anything else, and so it is with dread that she finds out that their new tenants will bring her back into contact with Captain Wentworth, the man that she was persuaded to reject by friends and family who thought he wasn't rich or important for her attention. Eight years have passed and she finds that she hasn't found his equal in all their time apart, but will he have any affection left for her after being so thoroughly rejected? The main positive point to be made about Persuasion is undoubtedly our protagonist Anne. She's a refreshingly sensible and perceptive character, surrounded by people who only really listen to her in times of crisis. And while she wants more than that, wants to feel the love and connection that she felt in her youth with Captain Wentworth, and it's something that she most definitely deserves. But it's nice to see a character in a romance story who doesn't seem to feel entitled to their love interest's romantic attentions; in fact, for most of the book she's convinced that the man she loves has his attention turned elsewhere. I also like that she's a character in her late twenties, positively an old maid by the standards of the time it was written. Captain Wentworth is a little harder to comment on, as he's in surprisingly not a lot of the book all things considered. I was kind of expecting him to have a much bigger presence in this, but the biggest impression I got was of how disappointing other people seem to Anne in comparison. Which kind of works. Kind of. I'd have liked to get more certain an impression of him, but what I got was thoroughly likeable and sensible enough to match Anne, though maybe not as perceptive. The writing overall was very enjoyable to read and there was a general pleasantness that was refreshing after a fair few books that were either serious or grim in tone. I found myself getting caught up in Anne's slowly repairing relationship with her first love and the scheming of other, older nobles in their intentions for their children's marriage prospects. There are a few other couples getting together that add extra notes of sweetness throughout the plot, which were perhaps a bit predictable, but nonetheless heartwarming. 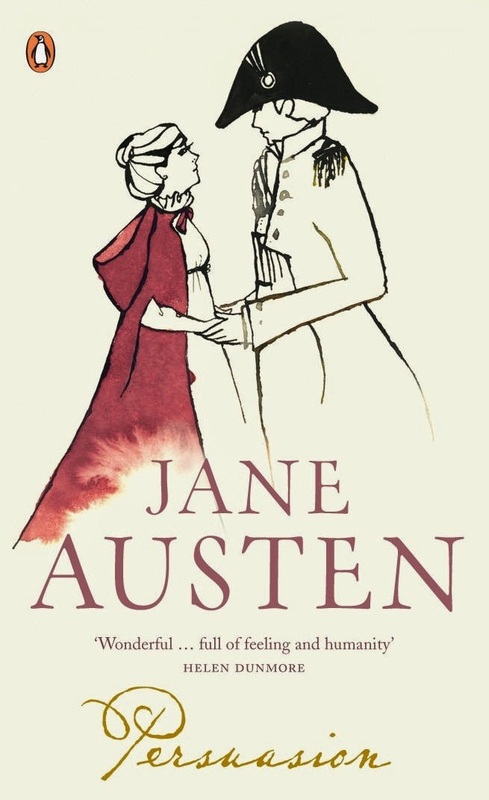 My only real issue is that once the main romantic conflict, that of Anne and Wentworth being aware of one another's rekindled feelings, has been resolved, the other plot threads are neatly summarised in a few pages. Apparently the extended schemings of people who are less than well-intentioned are a pathetic challenge to the power of a couple wanting to get married. Literally, everything is solved by them going up to the people who rejected their match years before and saying, "Hey, still want to get married, and he's rich now." It seems a tad too simple, especially after one character was so hyped up as a villain. But it's far from a deal breaker.